The Fighting Sioux are back: My passionate plea against Indian mascotsBut mascots are HONORING the bravery and fierceness of Indians! No. They're not. Honoring someone does not consist of taking their culture, reducing it to a one-dimensional racist stereotype, and representing them however you see fit. It's about power and who has the right to represent whom. Also, this cartoon helps. I don't consider a dude in warpaint and feathers making a mockery of my culture honoring. At all. Also, not all Indians are "fierce" and "brave," just like not all white (or Black or Latino) people are "<insert stereotype here>". I'm Irish (Norwegian, Catholic) and don't get offended by the Fighting Irish (Vikings, Padres)! That's because there is not an active system of colonialism and oppression marginalizing the Irish, "Vikings," or Catholics in our country. Native peoples are still living under colonial rule--take a look at stats from any area of society, and you'll see Native people at the bottom. I'm sorry if you feel "oppressed" as a catholic or a viking--but you still have a helluva lot of white privilege that kinda negates it. Sorry. What's next, animal rights activists telling us we can't use ANIMALS as mascots?! Where does it end?! Yeah, cause Native people (PEOPLE) are on the same level as animals? Thanks buddy. Thanks a lot. What about the Wizards? Pirates? Cowboys? Um, mythical beings or occupations are not the same as an entire race of people.Fighting Sioux Part 2: The ScienceCollege students were shown images of Chief Wahoo ("bad image"), Chief Illiniwek, and the Haskell Indian Nations University Indian ("good" images), as well as an image from AIGC's campaign (an actual good image), and then asked to generate "possible selves"--looking forward to the future and how they see themselves. Those primed with the mascot images (even the good ones), generated far less achievement-related possible selves than those with the control or AIGC image. 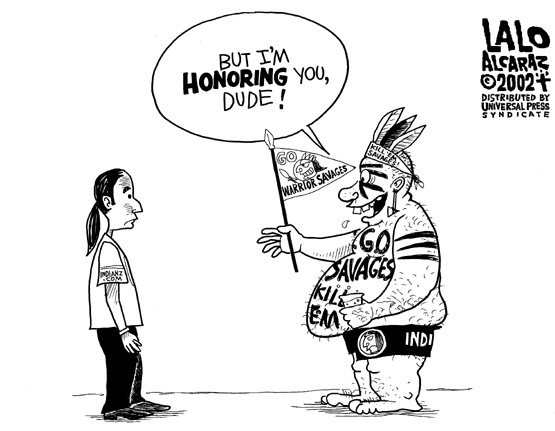 Basically, looking at a mascot limits the way Native students see themselves succeeding. ...and a horrible follow-up, Fryburg did another study that compared white students, and in all the areas where Native students' self esteem, community worth, and possible selves went down, white students went up. No active oppression in American society, right? White students directly benefit from racism against Native students. In sum: Scientific research shows that mascots and Indian stereotypes, regardless of if they are "good" images (Pocahontas, The Fighting Sioux) or "bad" images (Chief Wahoo), they cause depressed self esteem, decreased community worth, and decreased possible selves--even when students say the images don't bother them. And images are worse than words. The Native American Mascot: Tribute or Stereotype? By Sam SommersIn follow-up studies, the same researchers again presented high school respondents with various passages and images related to Native Americans. After reading about mascots (and seeing Chief Wahoo), Native American respondents scored lower on an individual self-esteem questionnaire, as well as a measure of their sense of community worth (i.e., feelings of respect and a sense of value towards Native Americans). In fact, scores for self- and community-worth were even lower among students who had seen Chief Wahoo than they were among those who read about the common depiction of Native American communities as suffering from high rates of alcoholism, suicide, and teen pregnancy. Perhaps most problematically, in a final study a variety of Native American mascots were shown to different groups of college student respondents. Afterward, students were asked to write about what their life would be like in one year. Those Native American students exposed to mascots were significantly less likely to use achievement-related language in anticipating their future than were students in a control condition. That is, having seen and read about mascots, Native Americans became less likely to make achievement-related predictions for themselves regarding good grades, graduating, finding a job, etc. The data from these studies are consistent with the idea that these mascots are often viewed positively, even by members of Native American communities. At the same time, they are also consistent with the conclusion that there are negative psychological consequences to such mascots, even if those who experience these consequences can't or won't articulate them when asked. By Rhonda LeValdoThe sole argument proponents have is that these mascots honor us by keeping our history alive. We cannot have such low standards for educating our youth. Right now, could any student name five tribes? Name the President that killed the most Native Americans in the largest mass hanging in this countrys history? Or name one boarding school? Native mascots dont teach that history, so lets stop using that argument. If there is such a burning desire to honorably keep Native history alive, invite a Native into your classroom to share that history.And:There are some people who do not find mascots and other Native stereotypes in media interesting or important, but Native American children have been increasingly learning about themselves from outside their own families and clans. Well over half of the enrolled tribal population lives in cities, away from reservation homelands. These children, all our children, grow up having to deal with the stereotypes thrown at them--not simply from commercial sources, but social ones. We cannot expect a Native child to deal with questions, taunts, insults, and slurs, not just from educated adults, but their own peers. Yet this is the situation our children are faced with. For generations, Native children have stood alone, with no one to fend them, and nothing for them to use in defense- both on the playground and in the classroom. Of course we cannot forget there are some people in their own families who have deemed these problems--mascots and other stereotyped Native media uninteresting, unimportant, and not worth our attention. Think about who it is hurting and how it will have an impact on the future.Comment: For more on the Fighting Sioux, see Even Sioux Voted Against "Fighting Sioux" and North Dakotans Vote to Retire "Fighting Sioux." " Native peoples are still living under colonial rule--take a look at stats from any area of society, and you'll see Native people at the bottom"
This is not the best of the arguments. Central to it is the idea that poverty means colonization.... well there are a hell of a lot of poor people of all colors who are not indigenous. As a casual argument, it seems fine to me. All she's saying is 1) that Natives are generally worse off than people in other ethnic groups. And 2) that this is caused by government policies, not just by economic factors. Some of those studies (depression) leave out It seems at first reading, the native American student "control group." There is enough other source anyway. My father hated polish jokes. Of course he was forced from a homeland where he was a native. About 3 million non-Jewish Poles were murdered. Good perspective all around yet assuming asses will always be around, also please look deep inside and find self strength of joys.